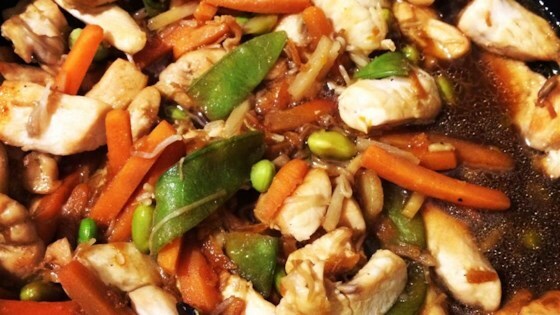 "Chicken stir fry has a light orange flavor. Quick, easy, and so good." Fill a large pot with lightly salted water and bring to a rolling boil. Stir in whole-wheat noodles and return to a boil. Cook uncovered, stirring occasionally, until the pasta has cooked through but is firm to the bite, 5 to 8 minutes. Drain well and set aside. Combine chicken stock, orange marmalade, tamari sauce, whole ginger root piece, and ground black pepper in a pot over medium-high heat. Bring sauce to a boil and reduce heat to medium. Simmer until sauce reduces and thickens; about 20 minutes. Remove sauce from heat. Stir in lemon juice and set aside. Heat peanut oil in a large skillet over medium-high heat. Cook and stir chicken in hot oil until golden, no longer pink in the center, and the juices run clear, 5 to 10 minutes. Remove chicken from skillet and set aside, leaving oil in the pan. Cook and stir the stir-fry vegetables in the same skillet used for the chicken until vegetables are almost tender, 4 to 5 minutes. Remove ginger root piece from sauce and discard. Stir chicken and sauce into vegetables and cook until heated through, 1 to 2 minutes. Tender pieces of chicken cook in a garlic and orange sauce. This was amazing thank you! The sauce was the best. I used fresh vegetables and did not have the noodles so served with basmati rice. Very good. I used soy sauce instead of tamari, and I minced the ginger (discard it? No way !). The marmalade in this is what makes it. Very good. We loved it and we will eat this again.